Welcome to “Small Blue Water Cruising Sailboats”. 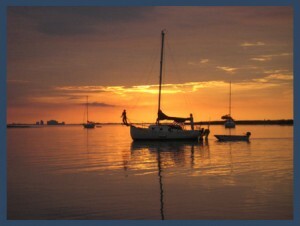 Sailboats are a dime a dozen but good quality sailboats capable of crossing oceans are a little harder to come by. The purpose of this website is to help you find hard to find small sailboats such as the Flicka 20, the Falmouth Cutter 22, the Dana 24 and more. All the boats discussed on this site will be below 40 feet with the majority being under 30. By definition, a “Blue Water” sailboat is one that can handle long voyages in all reasonable conditions. These boats go where typical sailboats would never think of going. Blue Water Cruisers are also generous on live aboard accommodations. Design focus is normally on strength, reliability and comfort versus speed and efficiency. A West Sail 32 is a good example of a slightly larger Blue Water Cruiser. Compare this to a Hunter of the same size. One can win a race but only one can circle the globe. I searched for a Pacific Seacraft Flicka 20 for months and finally found the one I wanted in New Orleans. The difficult part was finding a good boat that was in my price range and close by. To do this you need to be able to find every single one for sale, then narrow down your choices to ones that are close enough for you to pick up or have delivered. The more choices you have the better. This site is designed to help you do that. Also, for every boat we feature we have an associated article that discusses the specifications of that boat. We try to cover draft, engine options, beam, length, headroom and other valuable information that can help you make a decision as to which boat fits your needs. This site focuses mainly on bluewater boats, however, we also feature several small cruisers that may not be able to cross an ocean, but are great for inland waterway cruising. These boats are in a separate category called “Inland Waterway Cruisers”. If you need a skiff or dinghy for your boat and would like to build your own “Click Here” to go to our free boat plans page. We will be adding more boats as we finish research on the model.